Simon Delestre (FRA) and Chesall Zimequest powered to the first CSI5* class of the weekend, raising the curtain on the Longines Global Champions Tour of Monaco. In a fast paced two phase opener, the French national anthem rang out as Delestre took first bragging rights, finishing ahead of John Whitaker (GBR) with top stallion Argento, Maikel van der Vleuten (NED) with Dana Blue, and Ben Maher (GBR) with Madame X.
Frank Rothenberger put together a flowing but testing course, with a couple of tricky related distances requiring pin point focus and precision for the 53 international athletes who took on his course. Maikel van der Vleuten (NED) was the first to really throw down the gauntlet, cruising through the second phase with Dana Blue to set the time at 26.10s. Scott Brash (GBR) and his 9 year old rising star Hello Mr President soon put in an impressive clear, but slotted just behind to finish in 26.80s. Simon Delestre (FRA) soon bettered van der Vleuten’s time, powering effortlessly around the arena with the light-on-his-feet Chesall Zimequest, turning on a hairpin with the small and agile gelding able to rocket across the sand arena. Despite valiant efforts from Leopold van Asten (NED) with VDL Groep Urane de Talma, Emanuele Gaudiano (ITA) with Carlotta and Mégane Moissonnier (FRA) with Ultrachic de Charmois, Delestre kept hold of the top spot and took the first win of the weekend. 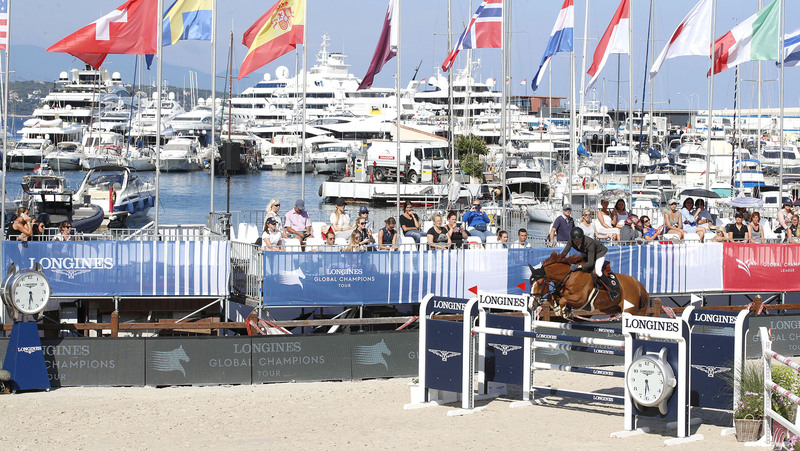 The next class, the GCL Monaco, will kick off at 20:00 local time, with all the action streamed live via GC TV and on Facebook Live.